Around 30% of mobile device users are using iOS in the China domestic market. 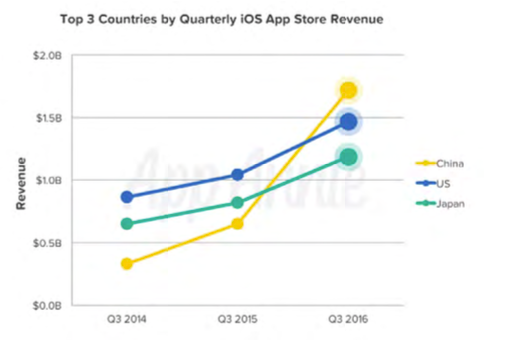 According to App Annie, in a little under a year, China has leaped ahead to become the world’s top revenue generator in the iOS App Store with some $1.7 billion earned in 2016. Similar to the global market, Apple App Store is still the dominant source to download iOS Apps. Local ad networks direct the audience to the Apple App Store to download the App. Except for local ad networks, many global ad networks have iOS traffic in China, such as Google Ads, AppLovin, UnityAds, Mobvista, Yeahmobi, Inmobi, Glispa, Matomy, Chartboost, etc. Set out below is a complete list of integrated ad networks in China domestic market. You can click the name of some media sources to check the configuration guides respectively, for other media sources, click here.